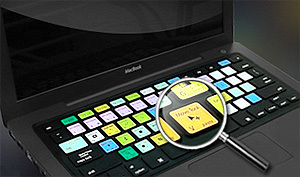 Keyboard Skins With Photoshop Shortcuts | OhGizmo! By Andrew Liszewski on 02/08/07 • Leave a comment! The skins come in a few different colors which are mostly designed to match the notebooks they’re made for but they also sell versions that have been printed with Photoshop keyboard shortcuts in addition to the standard keys. You can always tell when someone is a Photoshop power-user by how many keyboard shortcuts they use but if you’re a student who’s just started learning the software this could be a handy tool, in addition to protecting your investment from Coke spills or Dorito-dust encrusted fingers. The XSKN Photoshop skins are available in 3 color options. A black on white or white on black version to match your MacBook is available for $17.95 while a ‘multi-colored’ version is just a few dollars more at $22.95.